Some lawn care pros see a rise in demand for “natural” turf service offerings. Americans still want a lush, green lawn, but today, lawn care companies realize that some customers want that look provided by organic and natural lawn care solutions. According to Landscape Management’s Lawn Care Market Report survey, 44 percent of respondents offer an organic or natural lawn program. The challenges of offering these “green” programs include higher prices, lower effectiveness and the fact that some customers aren’t exactly sure what they’re asking for when they say they want an eco-friendly program. To be sure, lawn care firms apply their own definitions to these terms, and their program offerings run the gamut. Generally, many companies offer a program that includes all organic fertilizer or a “bridge” product that incorporates synthetic and organic fertilizer with minimal use of synthetic herbicides (i.e. spot spraying weeds or one herbicide application). A 100-percent organic program would include only organic fertilizer and no weed control at all or the use of corn gluten meal for weed control. Some companies are learning it behooves them to give clients options, even if many don’t end up choosing the “organic” or “natural” programs when they find out they cost more and weed control may not be as effective. Andrew Ziehler, president of Ziehler Lawn and Tree Care in Centerville, Ohio, used to have just one lawn care program. He’s rolling out two additional ones for the 2013 season; one of them is called Natural Touch Organic and is a 100-percent organic program with organic fertilizer and zero use of pesticides. Ziehler decided to add this program due, in part, to research conducted on his firm’s behalf as part of a University of Dayton master’s program project two years ago. Michael Bellantoni Inc., a full-service landscape company based in White Plains, N.Y., is seeing demand from his customers for pesticide-free lawn care. The firm recently bought out an organic lawn care franchise to help support its plant health care division, says President Michael Bellantoni. Ziehler and Bellantoni aren’t alone in pursuing this market. According to LM’s Lawn Care Market Report survey, more than 16 percent of respondents expect their “organic” or “natural” lawn care programs will grow more than any other service they offer this year. That ranked as the second “fastest-growing” service to traditional fertilization plus weed control, which came in at just under 40 percent. Even if there’s the perception of consumer demand for these services, barriers to organic/natural programs are price and effectiveness, lawn care companies say. The products often cost more and may not be as effective as their synthetic counterparts. 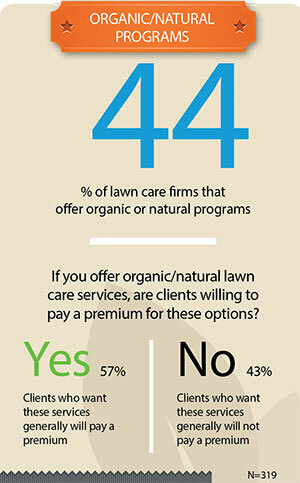 More than half (57 percent) of the Lawn Care Market Report survey respondents who offer an organic or natural program indicated their clients are willing to pay a premium for the service, but 43 percent said clients want the organic/natural lawn option, but aren’t willing to pay more for it. That’s what the research conducted on behalf of Ziehler’s company discovered, too. “Customers said they weren’t willing to pay a lot more, but they did recommend we have some choices,” he says. Even in Toronto, Ontario, where there’s a provincial ban on the sale and use of pesticides for cosmetic use, customers aren’t readily forking over extra cash to keep their properties green with “green” products, says Kyle Tobin, of LawnSavers Plant Health Care. “People here have a motto, ‘Keep Austin Weird,’” she says. “People are into beneficial nematodes, compost tea, Habiturf [a native turfgrass developed by the Lady Bird Johnson Wildflower Center at The University of Texas at Austin], disease-resistant plants, firescaping, etc.” When Trammell comes across someone looking for the “quick fix,” she takes a pass because it’s not a good fit. For most customers, even if they say they want an all-organic program, that’s a tough pill to swallow considering the primary reason many of them hire a lawn care company is to take care of weeds. Jim Campanella, owner of Lawn Dawg, which has 10 branches throughout the Northeast, says he’s seen demand decrease in his firm’s 100-percent organic program, which it has offered for five years. “People will ask about the all-organic program because they think they should,” he says. “But they’re starting to say, ‘We understand it doesn’t work as well in some areas and it’s not worth the higher costs.’” Lawn Dawg’s all-organic program is 81 percent more expensive than the traditional program. What’s driving consumer interest in organic products? Some communities require organic fertilizer, a move that in many places was initiated by a desire to limit the amount of phosphorous applied, says Tom Delaney, director of government affairs for the Professional Landcare Network (PLANET). From phosphorous restrictions many cities move to nitrogen next, he says. Some of these rule changes can be tied to President Obama’s declaration of the Chesapeake Bay as a national treasure during his first term. States surrounding the Chesapeake Bay are seeing a push for changes in when and where they can apply fertilizer.